"We are paying a very, very heavy price now, and we will in the future until we decide to understand that America [has] an essential role in maintaining peace and stability throughout the world." McCain was asked about the fresh spat between Perry, the Texas governor, and Paul, the Kentucky senator. The feud erupted over the weekend after Perry penned an opinion piece in the Washington Post blasting Paul's "isolationist polices" as "curiously blind" and "wrong." Firing back, a Paul adviser said Perry was "mischaracterizing" the senator's foreign policy views. The adviser said Paul prefers for the United States to avoid engaging in many hotspots across the world. Do Paul's preferences make him an isolationist? What a joke. Guns Over People teatards like McCain claim that America is broke but we must police the world. November comes quickly for the GOP stunt party. Perry and Paul, Grabbing attention, so others may inflict carrnage upon the masses unabated. Both are red herrings. McCain is smarter than that. Perry is an idiot, and Paul; is a narcissistic fool who'll say anything. In other words it is really smart NOT to take sides when both sides are stupid. Neither one of these two stand a snow balls chance of getting any closer to the Oval Office then the men's room. 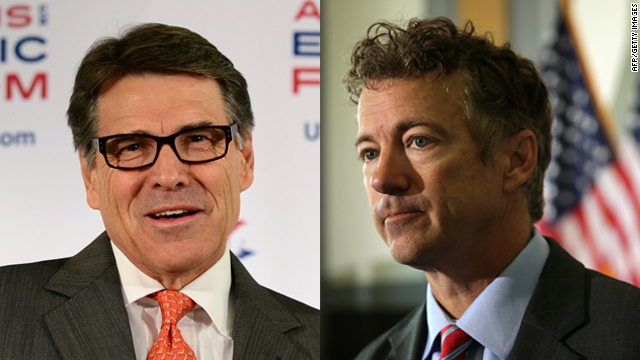 I would say that I have significant differences between both Perry and Paul. However, in contrast to Governor Perry, at least Senator Paul actually has a brain. McCain, the pinnacle of mediocrity, is a sore loser? He still can't accept that he lost...it's not like this was his first loss, but I guess losing to a black man is something that some people just cannot get used to. You want to discuss leadership, you mean old maverick? Explain to everyone how you chose the complete and utter imbecile that is Sarah Palin. The consider for a moment why you lost. Then try and talk about leadership again you silly old fool. That's what you will be remembered for – turning the mama grizzly moron loose on America. Two losers fighting for/over the man who picked the AK screecher over the twit. Perry is not smart enough to do things and is an ideologue that doesn't think. Paul is another ideologue that doesn't look at the world to see that his ideas aren't working here and now. I think we should seal the border, return all Alaskan republicans to their home, and confiscate her bus. Who? Rick Perry? Is he loud mouthing again? Whose waiting in the wings-Herman Cain? Do i hear the far off whine of a clown car engine? Isolationist as a term has in American rhetoric become something that means total non involvement. But in the republican rhetoric you are an isolationist if the first avenue is not military intervention to virtually all outside US conflicts seen as a national security threat some of which threats are so minor that they could be dealt with more effectively via strong , repeated and sincere, diplomacy and economic sanctions then and only then if they do not work a hint progressively of strong and if needed stronger threats of military action, the trigger for which would be Jihad attacks ( size irrelevant) on any super majority non Islamic nation that has declared all Islamic sects as having religious freedom and not to be considered terrorists unless they attack even one domestic citizen of any nation. Then even the start point is diplomatic negotiations , failing that economic sanctions and if the attacks continue within a short time say 1month and do not stop after 3 months an initial military retaliation of *100 proportions. My point is if a state is fundamentally Islamic and the Islamic extremists control what is military or jihadists cab do the first route is to get local Muslims to be capable of controlling that extremist majority... with our diplomatic and Economic support to do that we have to understand the quite tribal and in some cases ethnic as well as secular differences in most Islamic states just as it is in western Christian democracies. I won't take sides but I'll just say Paul is wrong wrong wrong, too funny, I could hardly tell who he sided with. Its our responsibility to police the world, he talks of the need to get involved in oil rich countries, what about Sudan, dafur, somolia, or a host of other countries who need help, no oil, sorry Charlie, gotta love their Christian values, wake up already, every word from their mouths ultimate goal is your tax dollars in their donors pockets period. What's to pick????? Their BOTH total LOSERS who will NEVER be president!!!!! Well McCain's foreign policy is consistent, if they have energy resources, get involved, if not, your on your own. It really is that simple, very sad, and frustrating, but its the same year after year, oil= get involved .